You are here: Home / Mobile / Which Version of Watch OS is on My Apple Watch? Your Apple Watch uses an operating system called Watch OS. This is a special version of Apple’s software that was designed specifically for Apple Watch hardware. 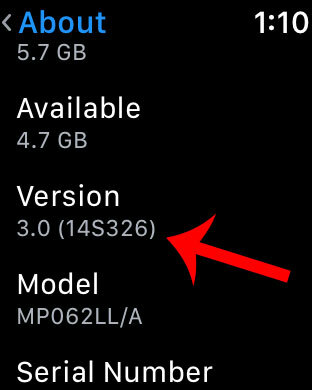 Like most operating systems, Watch OS periodically receives updates that add new features and fix existing bugs. 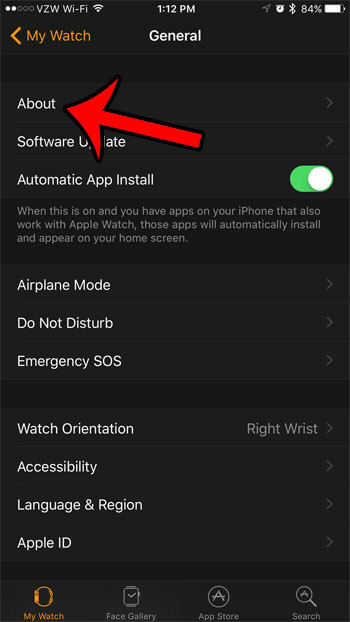 If you are attempting to do something on your Apple Watch and are having difficulty following the steps described in an article, or by technical support, then you may want to check the version of Watch OS that is on your device. 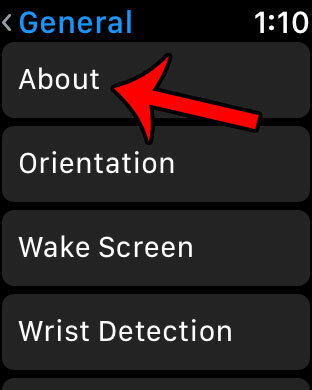 Our guide below will show you where to find this information on the Watch, as well as through the Watch app on your iPhone. 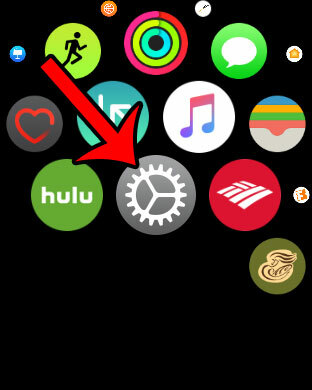 The steps below will show you how to find the version of Watch OS that is currently installed on your Apple Watch, You can find this information both directly on the watch, as well as through the Watch app on your synced iPhone. 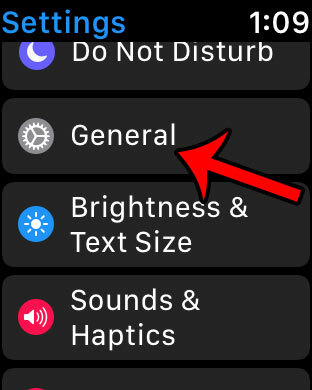 Step 1: Open the Settings app on the watch. You can press the crown button on the side of the watch to find the app screen. Step 3: Select the About option. 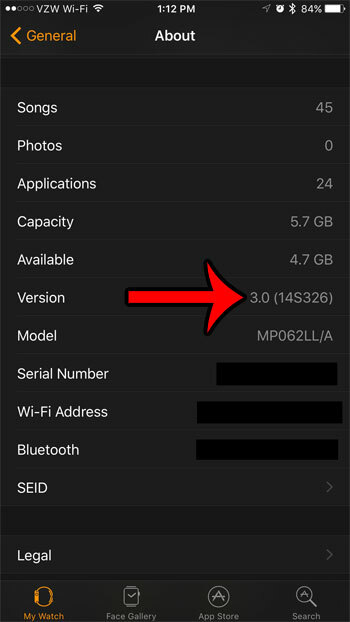 Step 4: Scroll down and locate the Version row. Your Watch OS version is shown there. Step 3: Tap the General option. Step 4: Tap About at the top of the screen. Step 5: Locate the information to the right of Version. This is the current version of Watch OS that is installed on your Apple Watch. 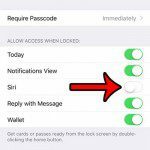 Would you like to be able to share screenshots from your Apple Watch? 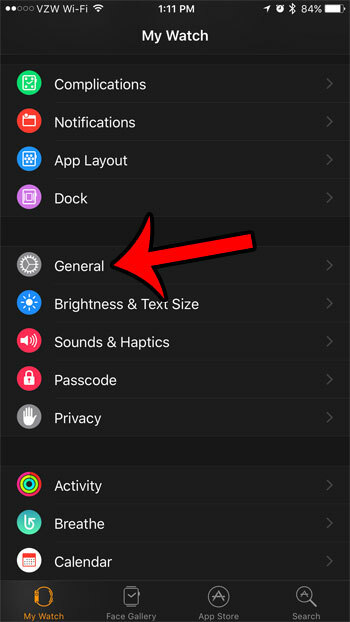 Find out how to enable Apple Watch screenshots so that you can start sharing them in the same way that you would share pictures you took with your iPhone’s camera.